In 2004, Scoot Fast Cruises commenced its operation in Bali. Scoot Fast Cruises is a speed boat service allocating a route from Sanur Bali to Lembongan Island where tickets can now be booked online on Easybook.com. Initially, the idea was to provide a fast commuter boat service direct to the islands in Bali, targeting people who found the chartered boat too expensive or the local boat too slow. Due to an increased demand, Scoot Fast Cruises have grown to become one of the popular speed boats among local tourists as well as international ones. The route from Sanur to the Lembongan Island is a direct course where it only makes one brief stop before heading straight off to Lombok. 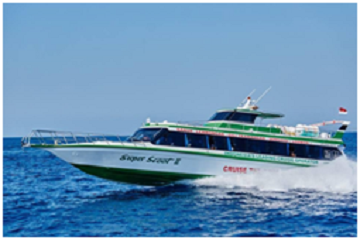 Therefore, boarding the Scoot Fast Cruises is the fastest option to reach Lembongan Island, Lombok and the Gili Islands. A popular hidden treasure, Lembongan Island provides a wide variety of spectacles including crystal clear blue waters, dreamy beaches, a mangrove forest as well as a mushroom bay. The place is pure heaven enclosed with excellent food all around the island. A few activities that can be accomplished encompasses snorkeling, watch dolphins fly over the translucent waters, pay a visit to the seaweed farm and enjoy the upbeat nightlife with sensational gatherings being held when the sun goes down. Lombok, another popular travel destination also has no shortage of attractions, both in and out of its waters. Spectacular natural beauty is on offer here whereby tourists can take a trek up the steep volcanic peaks as well as cycle through its lush evergreen rice paddies. The Gili Islands on the other hand, provides a diversified laid-back culture among all of the islands with a vision of paradise as it floats on a turquoise sea as well as fringed by white sand and coconut palms. Driven with a goal aimed at expanding the operational region as well as improving customer's service and fulfilling every demand, Scoot Fast Cruises have been evolving and is confident to become the leading sea transportation among many travelers. With our dedication towards the tourism industry, exceeding training and highly experienced staff, we ensure to provide a memorable cruise experience for many guests during their holidays. Scoot Fast Cruises’ vision is to amplify its regional operation and will always work towards improving its customer service to provide comfort among passengers. 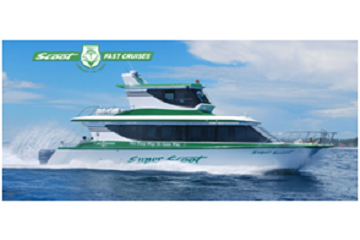 Scoot Fast Cruises provides daily boat trips for passengers to get to their desired destinations. There will be no hassle of purchasing Scoot Fast Cruises tickets via the counter as they can be officially booked conveniently online through Easybook.com.